I know that this book was written in 1990 and that many longer reviews have already been written (including one by this writer). But because constant questions arise, constant reminders need to be made. Rosenthal’s view of God’s ‘‘wrath’’ being different than the ‘‘tribulation’’ and the ‘‘great tribulation’’ is not new as he claims. 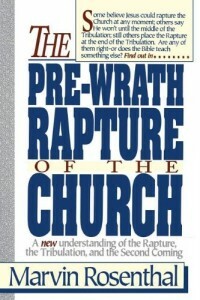 All rapture positions agree that the rapture occurs ‘‘pre-wrath.’’ the question, which has been debated for generations, is when that ‘‘wrath’’ begins and ends. Rosenthal simply defines these terms by his own rules and allows no one to play by any other. By insisting that God’s wrath does not begin until 21 months before the glorious appearing of Christ, he eliminates any need of the church being raptured until then. Pretribulationalists have always defined ‘‘tribulation,’’ ‘‘great tribulation’’ and ‘‘wrath’’ to mean the same thing–a seven year period. Embarrassing to Rosenthal is the appearance of ‘‘the great day of his wrath’’ in Rev 6:16-17 which clearly shows ‘‘wrath’’ in the first half of the tribulation. Rosenthal’s hermeneutical gymnastics to explain this away is an amazing thing to read and serves as a great example of forcing your own view into the plain teaching of scripture. Also, the defining of the ‘‘last trump’’ to be this entire time of God’s wrath comes a close second in odd interpretations. Why does the trump in 1 Thes 4 have to be anything other than God’s announcement of the rapture? If you are just now learning of this new point of view, by all means don’t be alarmed. It is not new and Rosenthal’s fusillade of his former pre-tribulational position is based on emotion, not exegesis. The rapture is still the blessed hope of the church!